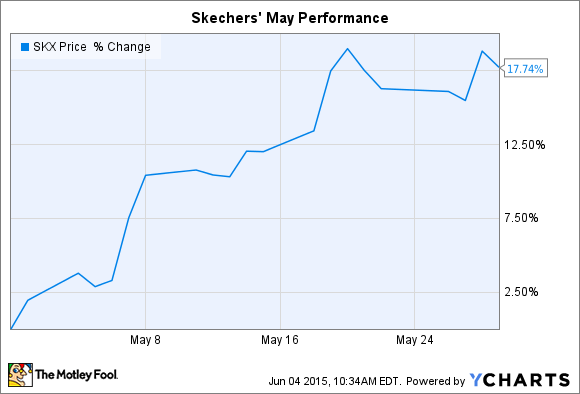 What: Footwear company Skechers' (NYSE:SKX) stock bounced 18% higher in May, according to S&P Capital IQ data. The jump put shares at an all-time high; they are up 143% in just the last year. So what: The stock rose as investors continued to digest Skechers' dramatically improving business prospects. The company in late April announced a 41% first-quarter sales jump to a record $768 million. At the same time, profit spiked by 80% to reach $1.10 per share. Both the top- and bottom-line figures handily beat Wall Street's first-quarter estimates. Subsequently, market research firm NPD Group announced that Skechers had blown past rivals Adidas and New Balance to claim second place in the U.S. sports-footwear market, behind only Nike. Skechers' 5% compares to Nikes' 62%. Many of Skechers' new footwear products are resonating with customers around the world, which is why international sales rose by 59% in the quarter. While impressive, global sales still have significant growth potential ahead as they move from the current 37% of revenue to management's 50% long-term target. Now what: Wall Street sees sales growing by 25% in the second quarter as profits bounce higher by 43%. And Skechers' management is just as bullish about the company's near-term prospects. "We are looking forward to what we believe will be record sales for a second quarter, delivering our back-to-school product, and a new annual sales record. We are comfortable with analysts' estimates for the second quarter, and we see upside opportunity in the third quarter," Chief Financial Officer David Weinberg said in a late-April press release.